A.A. Shanyavsky et al. On the Results of the International Interdisciplinary Symposium "Fractals and Applied Synergetics in Nanotechnologies"
The current state of investigations in the field of fractals and applied synergetics, nanoinvestigations and nanotechnology on the basis of the presentations of the International Interdisciplinary Symposium held in 2008 has been analyzed. The most topical problems of the new direction have been highlighted. The degree of influence of Russian scientists on the solution of said problems has been noted. The correspondence of the subject matter of projects supported by RFFI (judging by the presentations made) and the list of the most topical problems has been evaluated. 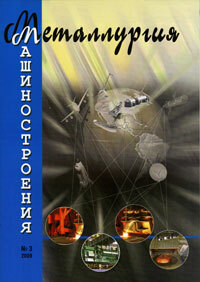 Methods of steel making in various furnaces have been reviewed and analyzed. The advantage of DPPTU-NP in respect of improving steel quality, ecology, industrial safety and economic effect is shown. A certified series of DPPTU and DMPTU is proposed. Continuing developments in liquid metal treatment technologies have made major contributions to the quality, performance and reliability of metal castinqs. The aim of this short review is to outline the development of inoculants and inoculation practices, and to also reflect on recent improvements in our understanding and practical control of graphite nucleation. The effectiveness of using iron-flux produced in rotary furnaces from converter slurry to make carbon ferromanganese in blast furnace No. 2 at OAO "Kosogorsky Metallurgical Works" is discussed. The way of crystallization of ingots from hypereutectic silumin from 20 % Si, is considered, allowing due to increase in speed of crystallization to receive in the central part of an ingot a zone with hypereutectic structure without or with fine crystals of primary silicon (35..85 % of the area of cross-section section of an ingot) and ободком, having usual structure, characteristic for hypereutectic silumin. The opportunity of influence for the sizes of the central zone and processes of formation of structure c by the help of processing of liquid metal the reagents containing hydrogen and nitrogen (ureas) and modifying additive Sb in quantity of 0,3-1,0 % is shown. The article discusses issues of protection of Mg-Li alloys against oxidation, inflammation and contamination with nonmetallic inclusions (NMI). It is shown that virtually all melting methods do not completely rule out melt contamination with NMI and its saturation with harmful Na and K. An acceptably clean melt can only be produced by fluxless melting and additional cleaning. Flux refining is not enough. Possibilities of cleaning the Mg-Li melt by dwelling at 720°C are shown. The work results allow to improve metal quality by more thoroughly cleaning it from NMI, improve its mechanical properties by obtaining a finer grain structure, recycle more production waste. It's already in the past century that alloys with shape memory effect (SME) were created. The article discusses the conditions of producing alloys with SME, and their application in machine building. It is shown that the shape memory deformation depends on the thermomechanical cycle conditions and alloy composition. At present, the range of applications for materials having SME has considerably increased as compared to the first attempts of using them. In their work, designers can use the unique properties of alloys taking the shape memory effect into consideration. Aluminum alloy billet structure is defined by the thermal and dynamic conditions of the melt solidification. Application of MHD stirring of solidifying melt and optimization of melt cooling parameters during the continuous DC casting allow to obtain the finegrained nondendritic structure of billets and to provide the high technological properties necessary in processing of billets into semifinished products. Based on analysis of possible ways of waste reclamation an integrated energy-saving technology of recycling metallic powders and oxides to produce porous filters for cleaning various solutions from suspended particles with a dispersity of 30…500 ?m is proposed. The article addresses the issue of electric current influence on the crystallizing alloy. Based on the classic Drude-Lorentz theory, it discusses the mechanism of the electron flow's effect on the crystallization centers in the melt. On the basis if that theory, a general regularity of energy transfer from accelerated electrons to crystallization centers in the inter-electrode space has been derived. Activation effect of electric current treatment on the strength properties of Fe-C alloys is described.